As anyone who has been to the dentist will tell you, it is normal for an appointment to be mostly spent with a hygienist! Just like dentists, dental hygienists are also excellent resources for a wide range of practical dental knowledge. To get the most out of your next dental cleaning in Williamsville, be sure to ask your hygienist these 5 basic questions! A hygienist’s primary job is to expertly remove plaque and tartar buildup from the teeth, and while doing so, they are also able to break up minor surface stains to help keep your smile nice and white. They have a very thorough understanding of all the factors that can cause persistent dental stains and what can be done to eliminate them. So, if you are curious about what you can do to make your pearly whites really shine, they will be able to let you know what could work for your particular smile. Is my home oral hygiene routine working? Did you know that most adults actually brush their teeth incorrectly? Many do not brush the recommended length, frequency, or method that dentists say is the best way to prevent tooth decay long-term, and often people do not know this until a cavity has already developed! 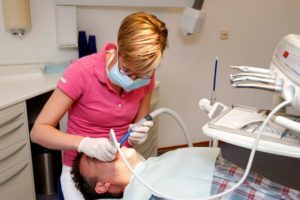 A hygienist can let you know just how effective your home routine really is and how to make it better, whether that consists of changing your technique or using different products. What is causing my sensitive teeth? Dental sensitivity is a problem felt by millions of Americans every day, and there is a long list of reasons a tooth might become sensitive either suddenly or gradually over time. After taking a close look at your teeth, a hygienist will be able to determine if it is being caused by teeth grinding, receding gums, tooth decay, thinned enamel, and so on. From there, they can give you strategies to lessen your sensitivity so your next ice cream cone or cup of hot chocolate does not cause you any pain! Should I be using a mouthwash regularly? There are a nearly endless variety of mouthwashes that can be found on store shelves today, and they can do everything from simply freshen your breath to help strengthen your teeth and even fight gum disease. Could you benefit from adding one to your oral homecare routine? A hygienist can let you know during your next appointment! In short, when you visit a dentist in Williamsville, every single member of their team can help you in the pursuit of a strong, healthy, and beautiful smile, so it is always a good idea to ask them any questions to get their input in addition to the doctor. With that, you will have all the tools you need to take the best possible care of your smile year round. At Amherst Dental Group, a team of highly-experienced dentists, hygienists, assistants, and administrators all come together to deliver truly one-stop dental care that delivers quality and convenience in equal measure. If you have any other questions about taking care of you and your family’s oral health, we are ready to answer, so feel free to contact us today.